Shaped like me; body positivity through sewing. It's one month until my book 'No Patterns Needed' comes out! Yaaaaaay! I can't believe it is finally here. And here's the cover. I love it! It's designed by the wonderful Evelin Kasikov, as in fact is the whole book. When people ask me what the book is about, I usual start by saying "sewing..." then I garble a few more sentences that trail away disappointingly until I find a way of changing the subject! So I'm going to write down here what gave me the idea for the book and explore the chain of thoughts that really kicked things off. Yes, this is a sewing book. 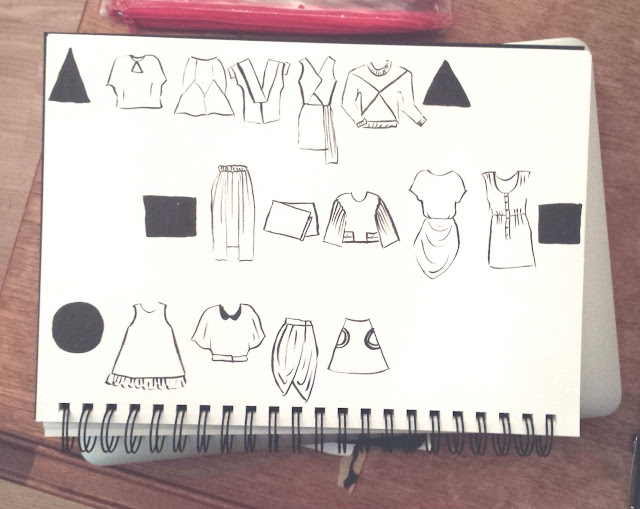 The aim is for it to enable you to make clothing by providing thorough, visual tutorials with no sewing jargon. It's an action-based book that can be dipped into project-by-project in bite-sized chunks. The ethos behind it is; learn through doing. 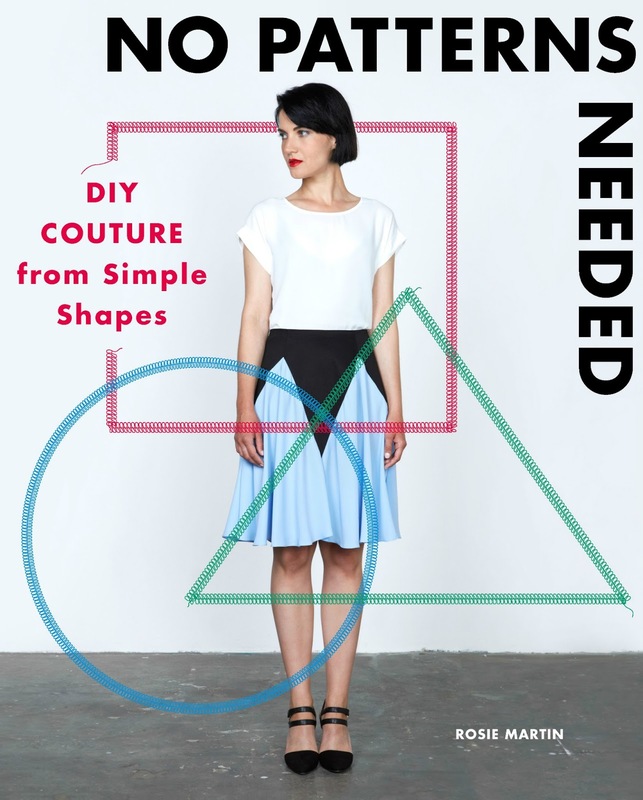 And, as the title suggests, all the tutorials show you how to make clothes without sewing patterns, based on simple body measurements or on existing items in your wardrobe. 'No Patterns Need' - cover design by Evelin Kasikov; photography by Victoria Siddle; modelled by Linda Peterkopa. The other key theme of the book is the one that is spelled out visually on the cover - the three simplest geometric shapes; the rectangle; the circle and the triangle. This is the part of the book I have a harder time describing in words. It's actually where the whole idea for this book came from, and that's what I'm going to write a bit about here. I was teaching a workshop at The Thrifty Stitcher and flipping through a sewing book from Claire-Louise's shelves whilst waiting for students to arrive. It included a page that described different standard body shapes, and the kinds of clothes you should be sewing to flatter your shape. It had an illustration that looked a bit like this. This kind of body categorisation often crops up on the pages of fashion magazines or even on websites of fashion retailers. It is always accompanied by advice telling you what you should and shouldn't wear to compliment your figure. 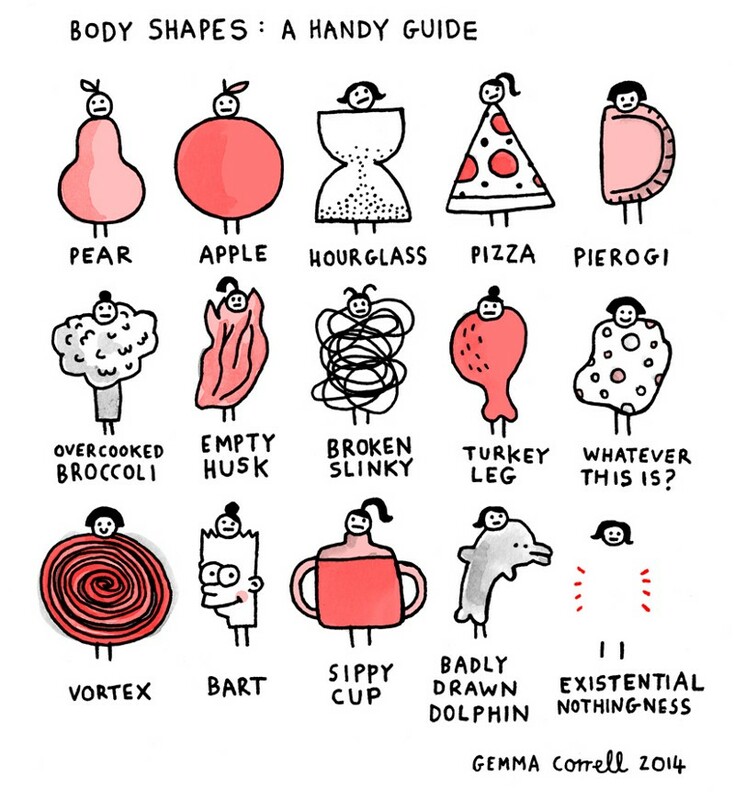 If I had to fit myself into one of these categories, it would probably be the rectangle, or the 'lean column' as described on this personal styling website called - ironically I feel - the Joy of Clothes. The Joy of Clothes has some scientific advice for me: "You need to create the illusion of curves around hips and bust and of a waist. Highlight your hips and bottom using pockets and pleats." This kind of language really annoys me! It feels as if they're speaking to me about a problem I need to fix, and to which they have the solution. The problem, of course, is my body, but luckily there's a fashion-shaped prescription to ease the burden of my flesh and bone woes! I like boxy tops and tight jeans and I can't remember the last time one of my outfits included a pleat. I feel if I follow their guidance I would probably end up in a corset with a dress borrowed from Elizabeth Bennet's wardrobe. I laugh in the face of their advice! To aid my laughing, I enjoy looking at this hilarious illustration by Gemma Correll. This kind of advice isn't that surprising coming from a fashion retailer, but I found it incongruous in a sewing book. Surely the beauty of sewing is the absolute freedom to make what you want. And a side effect of sewing is a deeper understanding that our bodies cannot be categorised into 'shapes.' In fact, through many a conversation about sewing, I would say that one of the key reasons many women start sewing is because they find their body doesn’t fit the standardized shape that high street clothing pedals. I think you'd be hard pressed to find someone with a 'standard' body shape, except for shop dummies! For practical reasons, of course, mass manufactured clothing has to have standard sizing. Katrina from Papercut patterns has written a great article for Seamwork magazine about how sizing of women's clothing has come about. I feel that this standard sizing can easily give fodder to the narrative that our bodies somehow aren't 'right.' Shop bought jeans always end about 4 inches beyond my ankle. I have to remind myself that this isn't because my legs are 'too short,' but that the trousers are too long. (Luckily, I can just chop the bottoms off). Many of us know the frustrations of trying premade garments on to find they fit at the hips but not at the waist, or across the chest but not at the shoulders. We often blame our bodies not the clothing. Part of the beauty of sewing is to allow your body to be, and just to make clothes that fit it, rather than attempt to force your body to fit into clothes. So, back to the book! I was at the gym and all this was swirling about in my head like clothes in a washing machine. In a moment of clarity that only seems to come to me when I've been sweating on the treadmill for 20 minutes, I thought: "It's time to reclaim geometric shapes, not as a symbol of reductive body categorisation, but as a beautiful building block that allows our bodies to be. Not as a stifling box that is lumped onto us, but as a starting point from which clothing can be made to fit all the bodies unique bits. 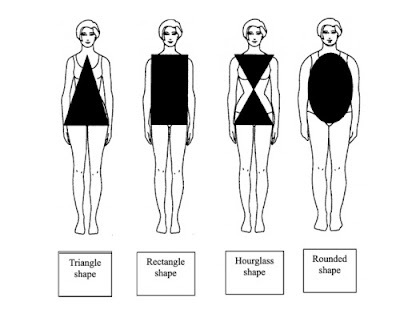 Many homemade garments begin with a simple shape - a rectangle or a circle - and are manipulated to fit the more interesting, varied shape of the human body. Often it doesn't take much - a few gathers here, a couple of darts there - to force a geometric shape into a beautiful garment. Simple shapes become building blocks and we are in control of them, not the other way round. Designing with just circles, rectangles and circles would be a playful reclamation of geometric shapes." And from this, a book was born. So, what is my book about? It is about reclaiming our simplest, geometric shapes and shouting out loud, "These shapes will not restrict us, they will give us freedom! We will wear what we want and we will make it ourselves!" Now, how do I boil this down into a couple of sentences that I can rattle off in a conversation? Any advice gratefully received. so excited about your book rosie! i know it will do really well! I love the idea that sewing is about taking a flat fabric and making it fit all the three dimensional curves of a body. In much the same way, your book takes two dimensional shapes - triangle, rectangle, circle - and teaches the reader to fit the to the body. Can't wait to read more! Yes yes yes! Freedom to choose and to love your body. Brilliant! I get really annoyed about how bodies should conform to an ideal 'womanly' shape and sometimes I love to dress myself in a big sack like dress and just be comfy. Also another gripe is talk about figures being womanly with curves, suggesting that straight lines are not womanly. It's so exclusive. We are all just beautiful. Anyway, can't bloody wait for this book and you know I love big shapes! I'm so excited for your new book! This is a beautifully-written post! This blog is so creative!